At Cornerstone Homes, we know Spring is just around the corner! The sun is getting warmer, the birds are out and about, fun events are happening, and living has never been better. 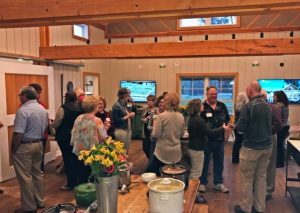 In March and April , we have a several exciting events planned for you where you’re sure to discover you’re the life you deserve in one of our popular 55+ communities. Find your pot of gold in beautiful Fredericksburg on Saturday, March 16 from 11 AM to 2 PM! In Barley Woods, you never have to get lucky — life is magnificent every day, all year-round. With luxurious amenities like a clubhouse, pool, and fitness center, single-level, low-maintenance homes, the friendliest neighbors around, and so much more, you’ll love every special moment here. Come tour our decorated models and clubhouse! You’ll see 7 attached and detached homes priced from the low $300s. Luckily, the beauty of this community is not a “myth…” It’s all real, and it’s waiting to welcome you! 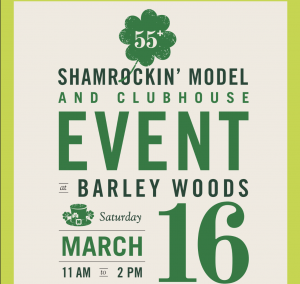 For more information about our Shamrockin’ Model and Clubhouse Event, please call 540-699-3009 or visit BarleyWoods55.com. We’ve recently broken ground at The Cove at Magnolia Lakes, our sought-after Chester community with amazing amenities such as an already built clubhouse, walking trails, a gorgeous lake with a Lake Pavillion and boardwalk, numerous outdoor gathering areas and community Gardens! There’s nothing else like this! 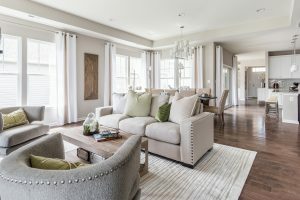 On Thursday, March 21 from 10 AM to 3 PM, we’ll take you on a bus tour from the Cove to our sister community in Fredericksburg, Barley Woods, where you’ll get to tour the Model homes that you can call your own in the Cove. You’ll be able to imagine yourself living in one of these homes! And don’t worry about having to drive or where to eat lunch — we have you covered with both! To RSVP to our Bus Tour Event, please email RSVPML@cornerstonehomes.net. 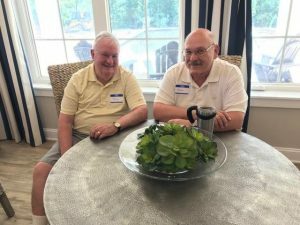 Every month our homeowners get together with a cup of joe and breakfast treats to catch up, plan fun events, and just get to know each other better. This is a great time to for you join the homeowners to get to know what life is really like living in one of our communities. So put one or more of these dates on your calendar and join us! We’d love to see you! Coffees are in the Clubhouses and start at 9:00 am. At Cornerstone Homes, your best life can be right here. When you live in one of our low-maintenance homes designed specifically for your lifestyle, you’re in complete control of how you want to spend your days. Enjoy the vibrant social life just outside your door, from the clubhouse to your neighbors’ backyards, lock and leave your home to travel far and wide, or simply sit back and enjoy the beauty right from your own courtyard or patio. Come join the fun! We can’t wait to see you at one of our upcoming events. And be sure to let the Sales Manager know if you’d like to join a Coffee Social! This is your chance to see firsthand what your life could look like! Remember, every day in a Cornerstone Homes community is like being on vacation. See you soon!